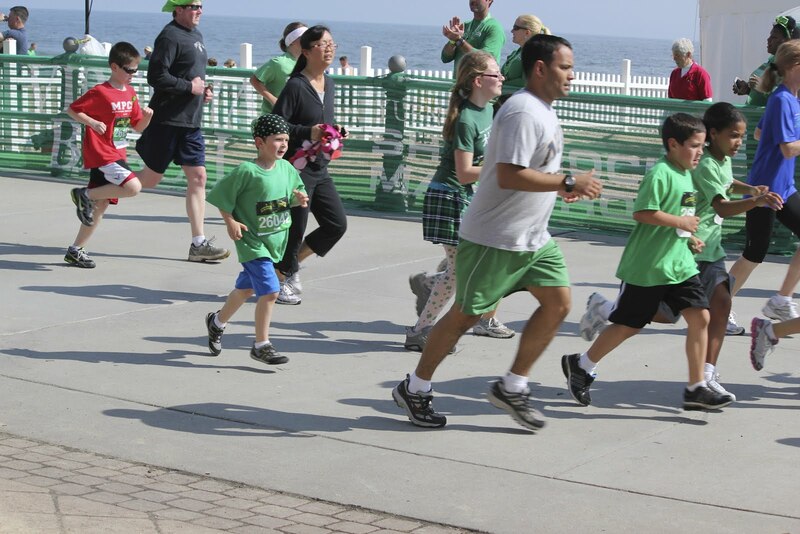 I watched my oldest complete the "Operation Smile Final Mile" on Saturday morning. 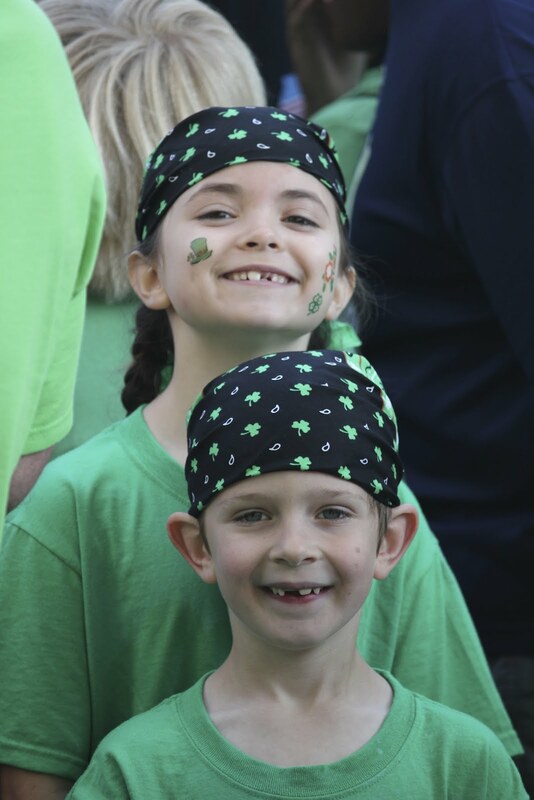 I am so proud of him- he had been running at school and logged 25.2 miles and then Saturday he ran with over 4000 other elementary school students that had signed up. He was so excited to run- I had picked up his race shirt and goodie bag while he was at school on Friday. When he got home and I showed it to him, he changed his shirt right away and checked out his bag (one of the drawstring backpack kinds). Saturday morning he got ready for his race and kept asking when it was time to leave. 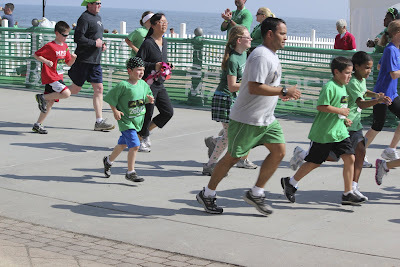 We got parked and got him down to the oceanfront and into his corral for the start. He was running with one of our neighbors. Waiting to start. He is so proud of that medal- and he should be! I know that there was a time that I couldn't run a mile. I know how hard a mile can be. 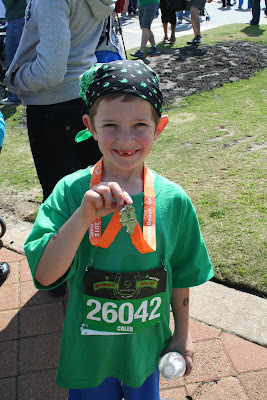 Here is this 7 year old who ran his mile (and the 25.2 before that!) and loved it! He's already asking about his next race. He's asked more than once when he can do a half marathon. I have to say, I am now proud of the example I am setting for him. I feel like I am doing my part. You are most definitely doing your part - above and beyond. I'm so proud of you! You're doing an amazing job - and it's not just the kiddos you're setting an example for. Love you! First, let me say thank you to your husband for serving. I am very grateful for the brave men and women like him that keep us safe and protect our freeedom. Second, you are amazing for taking care of a family on your own during deployments. That takes a very special type of person as well! Congratulations to your son - that is an amazing accomplishment at 7 years old! You should be proud that you are providing an example to your kids that will stay with them for life. You taking care of yourself and teaching your kids is not easy, but you're doing it and that's amazing!